The first version of this enduro motorcycle game was great, but this one is much better as you already have a nice fan base ready to cheer for you if you do a great run. The goal is to take your motorcycle and drive over all the obstacles that the staff has prepared for you and the other competitors. The faster you will get past them the more score you will receive, but remember that speed is not everything and the way you rotate the bike before and during the obstacle race will determine if you are a good or a great driver. 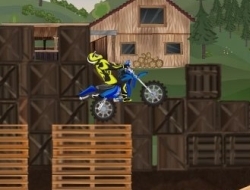 Try not to crash too many times as your lives are limited and you wont be able to finish all sixteen levels if you are careless in the begining where the tracks are much easier and shorter. Enduro 2 0.00 between 0 and 10 based on 0 votes.